A 2003 study regarding the effects of a golf specific warm-up and conditioning program established significant benefits of warming up before a round, especially for amateur golfers. Golfers need to be aware of the benefits of warm-ups, especially for injury prevention. Warm-ups help loosen your muscles, relax your body and improve the rhythm and timing of your swing. It helps you be confident, focused and ready when you hit your first shot. A proper warm-up is essential for peak performance. 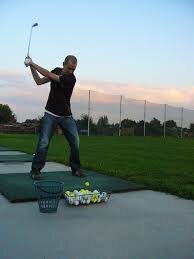 If you are out on the course a few times a month, you should make the most of your playing time. Your warm-up routine sets your pace for the round. Reach almost an hour before your tee time so you don’t feel rushed and can move slowly and relax. You need to visit the golf shop, use the restroom and change your shoes. Make sure you are in time to do all this stuff. Start your smooth and deliberate warm-up on the greens first. It doesn’t make sense to get to the driving range and stretch there and then wait motionless on the putting green till it is your turn. Start warming up putting to a green from twenty, thirty and forty feet and a variety of angles. Spend a few more minutes rolling putts to a tee or a coin from ten feet to three feet and hitting 25 six-inch putts that run straight uphill. Spending time around the greens will aid you in choosing the best greenside shots during the round and to decide where to land the ball on the putting surface. Stretching improves your range of motion up to 17%. This portion of your warm-up should be at least 15 minutes. This can include aerobic exercises and dynamic stretching. A short tee for all your shots on the range helps you hit the ball crisply. Your last few shots should be with the club you intend to use on the first tee, usually a 3 or 5-wood. Use the last five balls for smooth and slow motion swings that span 50 to 100 yards. This will reinforce balance which will help you on the course. In addition to the pointers mentioned above, time your routine so you don’t have to stand around more than a few minutes after your warm-up. If there is a delay, stand to the side of tee and make slow swings and stretch to stay loose. So, follow these tips to get into the right frame of mind before a round on the greens.